This article looks at the local (Korean) perspective of excessive international student recruitment and its impact. This article in the Korea Herald talks about the fall in the number of Korean students studying abroad. This is the third straight year that there has been a decrease in overseas Korean students, consistent with the falling Open Doors numbers as well. This article from the Chosun Ilbo talks about the decline in the number of school-aged students studying abroad. It cites economic conditions, the difficulties in readjusting to Korean life, and the fact that education abroad no longer guarantees a good job in Korea upon return. 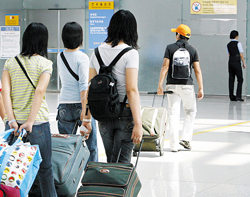 The number of Korean schoolchildren studying abroad has halved for the first time in six years. According to the Korea Educational Development Institute on Thursday, the number of Korean schoolchildren studying abroad rose from 4,397 in 2000 to peak at 29,511 in 2006 and started to decline beginning with the global financial crisis in 2008. The number fell to 14,340 in 2012, marking a 51.4 percent drop in six years. According to statistics compiled by the Education Ministry and KEDI, the figure includes those who go overseas for one or two years to study even if they are not registered for regular academic courses. Students who move overseas due to immigration or because of their parent’s jobs were not included in the tally. The number of elementary schoolchildren who study abroad, which accounted for the largest share of the group, rose to 13,814 in 2006, but fell to 6,061 in 2012. The number of junior high school students in this category fell from 9,246 in 2006 to 4,977 in 2012, while the number of high school students fell from 6,451 to 3,302. Experts cited the decline to the ongoing economic slump and a growing awareness among parents that studying overseas no longer translates into a leg up when it comes to landing good jobs in Korea. The Korean education system is always one of paradoxes. In a recent poll of over 1,000 adults in the 21 OECD member countries, it was found that only 11% of the respondents answered that they respected their teachers; this comes in spite of the fact that Korea remains one of the highest performing countries in the world.